It’s fair to say that solar power and ‘greener’ lifestyles are sweeping across cities and communities in the US. Despite variations in climate, we’re seeing solar homes, apartments, residential complexes and group/community purchasing programs springing up in California, Colorado, Florida, New Jersey, Massachusetts, Ohio, Texas, Vermont and other states. This activity hasn’t sprouted up spontaneously from nothing however. A wellspring of innovation — technological, economic and social — is tapping into a long-brewing desire among many Americans to live ‘greener,’ healthier, more balanced and affordable lifestyles with more in the way of a connection to nature. The country’s economic troubles and a growing awareness of the effects of climate change seem to have brought all this to a ‘tipping point’. Innovative government programs providing education and training, as well as financial support and incentives, are supporting this movement, spurring innovation among businesses large and small that see and believe in the potential of clean energy and ‘green’ building and living. There is a desire to conserve natural resources and protect the environment, simultaneously rebuilding America and its economy. This case looks at some of the drivers for such development and digs into specific success stories, legislation and programs that working today so that others may follow suite. So that we might all benefit from a more sustainable way of living. Starting at the top, the US Dept. 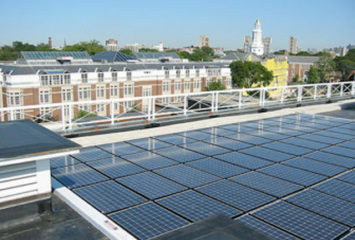 of Energy (DOE) in 2007-2008 established a foundation for the Solar Communities Program by designating 25 major US cities as Solar America Cities. DOE and local government staff identify barriers to adopting solar energy and develop solutions. One focal point of the Solar Communities program is finding and providing the means of making solar power systems more affordable. A wide range of possibilities exist for buyers and industry participants, including: investment tax credits, US Treasury Section 1603 grants, rebates, depreciation allowances, special-purpose loans and loan guarantees. Solar Renewable Energy Credits (SRECs) that can be sold on public market are available in states where solar power is included in a Renewable Portfolio Standard (RPS) or Alternative Energy Standard (AES). Further reducing the cost of installing a solar energy system, state governments, electric utilities and manufacturers also offer financial incentives and assist with obtaining financing. The DOE’s “A Guide to Community Solar: Utility, Private and Non-profit Project Development,” is an essential information resource for anyone in any community or organization thinking about starting up or carrying out a community solar power program. In April, Solar Communities Program participants from across the country shared their experiences and knowledge at the Solar America Cities fourth annual meeting in Philadelphia, Pa. This presentation by Solarize Portland is chock full of useful information about how to start up and establish a community solar program. 2010 proved to be a pivotal year for Solarize Portland. The number of residential solar PV systems installed by program partners and independent installers spiked up 5x to well over 500 last year, and the program has expanded from four Portland neighborhoods to include solar installations in Pendleton and Salem, as well as commercial installations at Columbia Sportswear and Nike. There are even businesses out there that have been created with the express purpose of assisting people in the speedy development of solar-powered communities. In September, One Block Off the Grid (1BOG) announced the launch of One Nation Off the Grid, a project that offers 2,081 solar power group buying deals in 34 states, along with an interactive map chock full of granular detail on state and county clean energy policies and potential job creation should more proactive renewable power policies be adopted. The One Nation Off the Grid project is the result of 1BOG forging 175 partnerships with solar installers across the US. All profits from the nationwide program will go to Kiva City, the US arm of microlender Kiva.org, which was launched recently in Detroit as part of a commitment previously announced at the Clinton Global Initiative America in Chicago. Forming a group or community to collectively purchase or lease solar photovoltaic (PV) power or solar thermal systems is one way Americans are addressing the key issue of reducing the upfront cost of solar power. 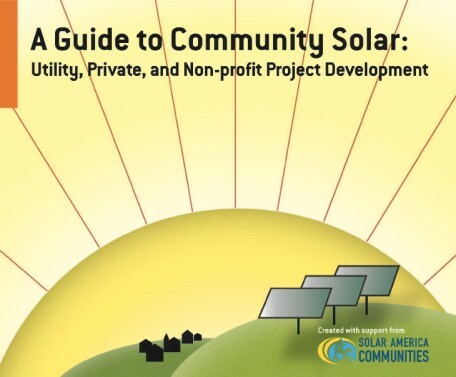 The DOE’s “The Solarize Guidebook: A community guide to collective purchasing of residential PV systems,” is an excellent place to get started. A growing number of architects and private and non-profit housing and property developers are incorporating solar power systems as core design elements in a new generation of ‘smart’ and ‘green’ houses and buildings. Typically designed and built based on a green living and/or working aesthetic, they are being built with energy, water and resource efficiency and conservation foremost in mind. Besides solar power systems for producing electricity and heating water, green housing communities typically incorporate passive solar design principles for space heating, cooling and ventilation. 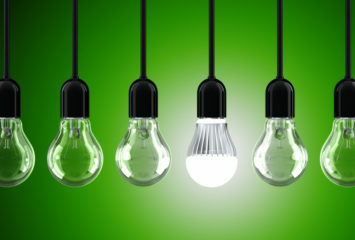 They also include smart electric and power meters and energy management systems, Energy Star appliances, paints and finished with low volatile organic compounds (VOCs), as well as highly rated, energy efficient windows, ‘tankless’ water heaters, compost toilets and recycled, construction materials, including insulation. California’s first solar-powered apartment community, the Solara residential complex in Poway, San Diego County is a great example of how motivated public-private sector collaboration can deliver green housing and lifestyles that not only minimize resource use and waste, but provide healthy, comfortable, convenient and affordable living. Part of a mixed-use development owned and developed by Community Housing Works (CHW) and designed by architects Rodriguez Associates, the California Energy Commission recognized Solara as the first Zero Energy New Home. Solar power is a central aspect of living in the 56 garden-style apartment community. Solara consists of six two-story residential buildings and a 2,100 square foot Community Center on 2.5 acres. Built on a formerly “blighted” site, Solara is flanked by a community park and a greenbelt bordering a floodway. Residents live within walking distance of shopping, services, City Hall, a public library, schools and a major mass transit hub. Connected to San Diego Gas & Electric’s smart grid, Solar is outfitted with Elster smart meters that run both ways — residents’ metered electricity usage, and their electric bills, are automatically reduced when the complex generates a surplus of electricity, which is fed into SDGE’s two-way smart grid. Solar-powered, ‘green’ communities are sprouting up all around the US. In addition to proving that living in ‘green’ buildings and housing can be energy efficient, conserve resources and minimize waste, owners, developers, architects and residents are proving that they can also provide healthy, comfortable, convenient and affordable lifestyles. They’re also instilling a greater sense of community among residents and neighbors.